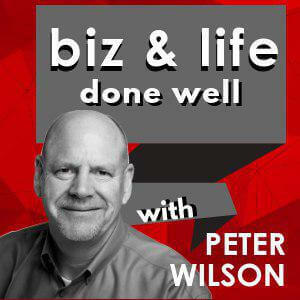 bizmktg.com is happy to announce that the “Biz and Life Done Well with Peter Wilson” podcast is now live with three episodes available today and new episodes being released weekly on Friday mornings. Welcome to the biz and life done well podcast where we explore what it means and what it takes to do business and life well. I’m your host, Peter Wilson. If you’re like me, you’re intrigued by stories of common people who have achieved uncommon success in business and life. Join me as I interview fascinating people about how they got started, their successes and failures, their habits and routines, and what inspires them. I’m a business owner. I have an online marketing firm called bizmktg.com. We help businesses win online so they can grow faster. Our clients include dentists, doctors, lawyers, chiropractors, auto repair shops, pest control, plumbers, heating and air contractors, electricians, home service contractors , as well as franchises. We’re based near Seattle along the water in the city of Edmonds. Our office is located right next to the Edmonds sea ferry terminal so we have a great view of the Puget Sound and Olympic Mountain range. Even though we’re based in Edmonds we have clients all over the US and Canada. We have clients in 28 states. I started the business in late 2011 after spending several years working as an online marketing and business development manager in the corporate world. Working at Microsoft, ADP, Ally Financial and Reynolds and Reynolds along the way. I want to satisfy my own curiosity about people I see having success in their lives. I’ve found that podcast interviews are an effective way to have a focused conversation without distractions and really get to know them and what makes them tick. I want to learn from a variety of people. Different ages, professions and stage of life. Some still in college, some retired and some in between. I want to share what I hear with others. The goal of “biz and life done well with Peter Wilson” is to entertain, inform and hopefully satisfy your curiosity about what it takes and what it means to be successful in business and life.